The All Progressives Congress (APC) ahead alerted the public over false statements being issued by the Benue state government to discredit their governorship flagbearer, Barr Emmanuel Jime. A statement by the party’s state Secretary, Hon. Peter Akulega said the government has planted stories in newspapers in attempts to link their governorship candidate the Fulani herdsmen organisations.“We wish to alert the general public to the new tactics being employed by the failed administration of Benue state governor, Samuel Ortom to score cheap political points at the expense of his opponent who is head over shoulders more competent than he is. “Realising that he cannot sustain an issue-based campaign to sell himself to the Benue people and desperately determined to daint the hard-earned, time-tested reputation of the Benue governorship flagbearer of the All Progressives Congress, Rt. Hon. Emmanuel Jime, Governor Samuel Ortom is using tax payers money to sponsor advertorials in newspapers in the name of “Fulani herdsmen” under various fictitious non-existent groups. “One of such was published on Daily Trust newspaper website today, 14th October 2018 with the title “Fulani group backs Jime for Benue governorship” in which they alledged that former Special Adviser to Governor Samuel Ortom on Fulani matters, Alh. Gololo, who according to them, is now the leader of a non-existent group called “APC Fulani Nationwide”, backed the emergence of Rt Hon. Emmanuel Jime as the APC Benue governorship candidate alleging that he would ensure the return of open grazing in the state. “Suffice to note that we have been aware of this publication for over a week and rightly issued warnings to the public to be aware of the antics of the sinking regime of Governor Ortom who, rather than showcase his achievements after four years in office, prefers and plans to politicise the killings of his own people for his singular selfish political interest. “Let it be made abundantly clear that the open grazing prohibition and ranches establishment law was passed under an APC government and our governorship flagbearer, Rt. Hon. Jime who began the debate of ranching as far back as 2011 as a member of the House of Representatives has stated times without number that he has no intention to repeal or abrogate the law when elected as Governor. He rather stands a better position to properly implement the law as a trained lawyer and experienced two termed federal lawmaker. “We hereby call on the general public to specially note and disregard this shameful act by the Ortom led administration. We enjoin every discerning mind to hold this administration accountable over issues of the widespread insecurity in state and non-payment of salaries and pensions despite ample supply of funds from the Federal Government. 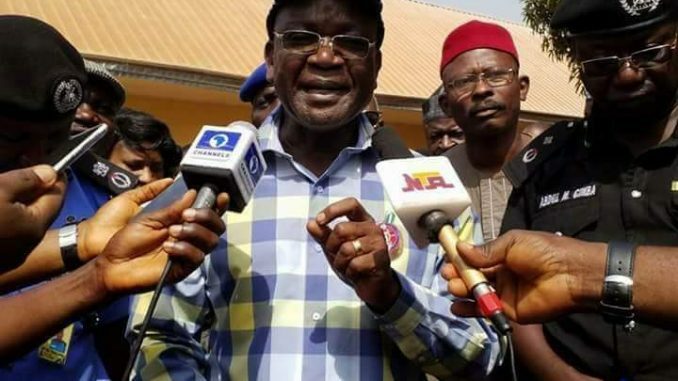 “Rather than pre-occupy himself with our candidate, we call on Governor Samuel Ortom to explain to Benue people why he has not been able to commission even a single soakaway in the over three years on the same seat and during the same period that his counterparts have made their states enviable.” The statement read.